Hebe ‘Bronze Baby’ (syn Hebe ‘Bronzy Baby’) is a compact, evergreen shrub, growing to 18 in (50 cm) high, and a little more wide. 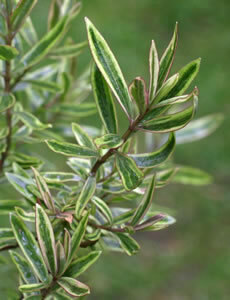 The spear-shaped leaves are 1.5 in (4 cm) long and 0.3 in (8 mm) wide, mid-green with a cream edge, turning bronze in winter. Not free flowering. This hebe is hardy in the UK. It appears to be a variegated form of Hebe ‘Mrs Winder’. Community Plant Variety Office Title No 20633, bred by Joh. Van Niekerk.